Gallery of images, which were created by the solargraphy technique. 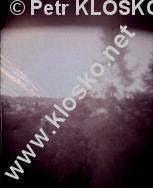 Pictures were taken on B/W photo paper (FOMASPEED C311, HARD GLOSSY-shiny) with several kinds of pinhole cameras. Pictures were taken over several months during September-December 2015. The length of exposure is presented with detail of the individual picture. Selected pictures are also published regularly on my twitter media timeline.